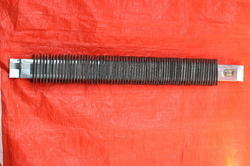 Manufacturer of a wide range of products which include air heater finnd rec and strip finnd heater. Strip Finned Heaters are used for both forced and natural convection air heating. The Finned Strip Heater's basic design consists of a helically wound resistance coil placed in a specially designed ceramic insulator. The resistance coil is mechanically connected to screw terminal for positive connection. GI fabricated box is used to house the heater assembly. Fins are mounted to the rectangular GI box. The fins have been specially designed to provide maximum surface contact for good heat dissipation into the finned cross sections, thus resulting in rapid heat transfer to the air. INDUSTRIALS HEATORS Strip Finned Heaters are high-quality, coiled nickel-chrome resistor wire is uniformly spaced over the width and length of the finned strip element, then embedded in high-grade refractory material which both insulates the wire and transfers heat rapidly. Fins are provided to improve the heat transfer to the air.